Migraines are really painful, debilitating headaches that affect all sufferers the same way, right? Sorta. Yes, migraines are painful and debilitating, but no, they’re not all the same. In fact, it’s normal for sufferers to experience totally different migraine symptoms, depending on their personal triggers and patterns. Plus, there are several different types of migraines to begin with. So how do you know which type of migraine you’re dealing with—or if it’s even a migraine at all? Doctors break down migraines into several categories, and learning more about which migraine type you might have can help you get a diagnosis and a personalized treatment that works for you. 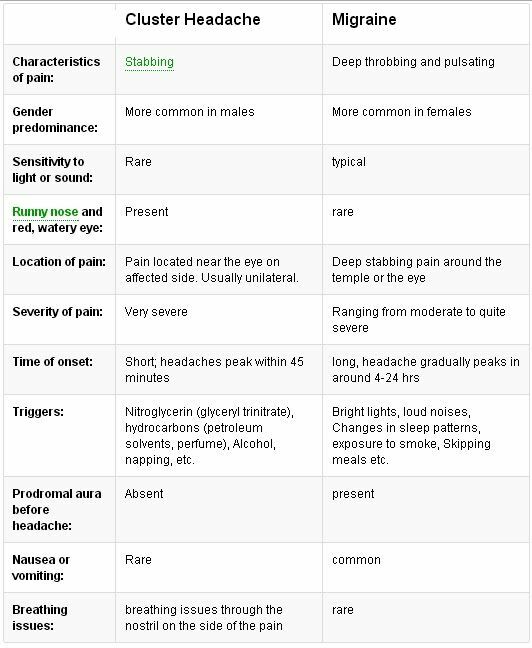 Let’s take a look at the types of migraines, starting with the most common. Main symptoms: throbbing pain that starts on one side of your head, moving around tends to make the pain worse, and it’s normal to feel nauseous, dizzy, and sensitive to light and sound. The first and most widespread type of migraine is known as the common migraine. It, like other headaches formally recognized by doctors, is listed in the International Classification of Headache Disorders (ICHD-3). If, for at least three months in a row, you get a headache more than 15 times per month, and eight of them have migraine symptoms, that means your migraines might be becoming chronic. Chronic migraines will typically have the same symptoms as episodic migraines that just pop up now and then, according to the American Migraine Foundation. Duration: can range from a few minutes to a full hour, usually before the migraine attack itself starts. The migraine itself can last from 4-72 hours. About 25% of people who suffer from migraines also experience aura. Migraine with aura is a broad category listed in the ICHD-3, and can cause visual disturbances and neurological symptoms, as well as unpleasant feelings like a numb face or tongue, and pins and needles that spread across your body. The ICHD-3 break these down even further into four types: typical aura, brainstem aura, retinal aura, and hemiplegic. Typical aura can bring on visual symptoms, such as temporary blind spots, geometric patterns, zigzag lines, stars or shimmering spots, and flashes of light, notes The Mayo Clinic. Brainstem aura involves symptoms that seem to originate in the brainstem, like difficulty speaking, double vision, ringing ears, or vertigo. Hemiplegic migraine involves symptoms like motor weakness, or a loss in the strength of your muscles, usually on one side of your body, and according to Genetics Home Reference, you could struggle with language and feel confused or tired. Like with typical aura migraines, these symptoms usually last just minutes and no more than an hour (however for some people, it can be longer), but memory loss and problems with your attention span can linger for weeks or even months. Sometimes, hemiplegic migraines can cause more serious issues, like seizures, coma, and long-term problems with brain function and body movement. These might be frightening facts to read, so know that these types of migraines are rare and the extreme side effects are uncommon. Menstrual migraines, or “hormonal migraines” are pretty much what they sound like—migraines in women triggered by hormonal changes. They’re listed in the official ICHD-3, which notes that menstrual migraines can happen with aura or without, and usually strike just before or at the beginning of your period. If you get migraines during this time in two out of three periods, they might be menstrual migraines. According to the US Office on Women’s Health, menstrual migraines might be triggered by the quick drop in the hormones estrogen and progesterone that happens before your period starts. They affect about 7-19% of women. That said, most women who get menstrual migraines also have migraines at other times, too. A frustrating but good-to-know fact from the Journal of Headache and Pain is that menstrual migraines tend to last longer than your average non-menstrual migraines, and might be more painful. Vestibular migraines are surprisingly common, reports Cephalalgia, affecting 30-50% of migraine sufferers. To get more specific, vestibular migraines can give you sudden bouts of vertigo, where you either feel like you’re moving when you’re not, or see the world spinning, according to ICHD-3. Sometimes this happens when you move your head, or when you see something particularly stimulating. Interestingly, as is listed in ICHD-3, the vertigo attacks might not always occur right before a headache sets in, like aura symptoms. In fact, Cephalalgia notes that they might last for just a few seconds or even for a few days. Now this one might you do a double-take. If you get aura symptoms but never get the telltale splitting pain in your head, you might have a migraine without a headache, sometimes known as a “silent migraine,” “painless migraine,” or “acephalgic migraine.” The ICHD-3 simply calls them a typical migraine with aura without a headache. An acelphagic migraine, or a migraine with no pain, can have all the same symptoms of migraines with aura, except the headache never shows up, according to Brigham and Women’s Hospital. Interestingly, the American Migraine Foundation notes that migraines without headaches become more likely as you get older. Yep, you read that right—abdominal. Sometimes, instead of a headache, a migraine can cause extreme pain in your abdomen. This is an abdominal migraine, and it’s more common in children than adults—though 2/3 of them end up developing migraine headaches as adolescents, reports The Migraine Trust. The ICHD-3 lists it as a condition that might be associated with migraines. According to the American Migraine Foundation, abdominal migraines cause pain near the belly button, and can also make you feel nauseous, give you no appetite, cause vomiting, and make you look pale. Yale Medicine notes that, just like common migraines, abdominal migraines can be triggered by things like stress, bright lights, and food additives like monosodium glutamate (MSG). They’re also typically treated using the same medications as standard migraines with headaches. Status migrainosus is basically a migraine (with or without aura) that lasts longer than the standard max of 72 hours. The ICHD-3 recognizes status migrainosus, and points out that overusing migraine medications could be a likely cause. Status migrainosus can be extremely frustrating, to put it mildly. The National Headache Foundation calls it a “trick candle on a birthday cake,” because the headache might briefly respond to medication, only to flood back after a break. Tension headaches are the most common headaches for adults. The pain is typically less severe than in migraines, more of an ache than a throbbing pain. They affect both sides of your head. They don’t usually hurt as badly as migraines. They don’t get worse when you’re active. They don’t cause symptoms like sensitivity to light and sound, or nausea. Cluster headaches cause extreme head pain, but, unlike migraines, they appear up to eight times per day in bursts (or clusters) of weeks or months and feel more like stabbing pain, than throbbing. Sinus headaches are caused by a sinus infection and are rare. The National Headache Foundation notes that people often think they have sinus headaches when they actually have migraines. According to the American Migraine Foundation, post-traumatic headaches happen after a traumatic injury, and can cause symptoms that mimic migraines, like severe throbbing pain that gets worse if you move around, nausea and vomiting, and sensitivity to light and sound. It typically ends within a few months but can become “persistent” and last longer, especially if you have a family history of or already suffer from migraines. As the American Migraine Foundation reports, new daily persistent headaches are what they sound like—headaches that suddenly begin to pop up every day, keeping you in pain for over three months, reports. You’ll need to see a doctor to learn the true cause of NDPH, but it can be treated like a migraine if the symptoms are the same. If you have painful, recurring headaches, you know one thing: You want them to go away. The first step is finding a doctor to help you figure out just what a kind of headache you’re dealing with. Once you know that, you’ll be better able to figure out the best treatment. Photo by Hamish Duncan on Unsplash.